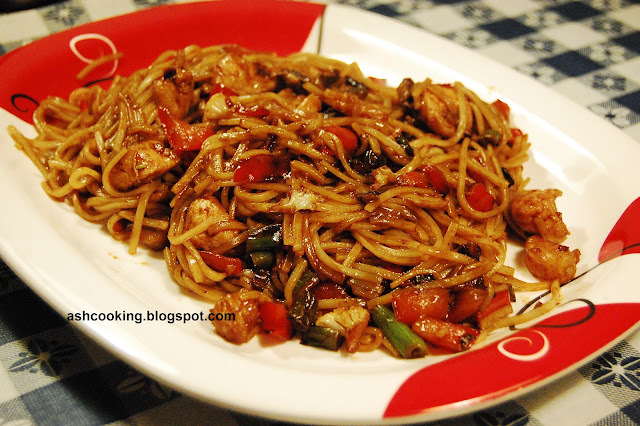 It's been days; years to be specific when I last tasted the scrumptious plate of noodles sold at a local fast food corner near to our locality in Kolkata. Noodles remind me of the tiffin my mother regularly packed for me while I went to work. Post marriage, when a new life with my hubby coerced both of us into juggling work and home, we hired a cook, who although knew very little about cooking at the time she joined us, grasped very quickly the skill of cooking noodles perfectly with a tad help from me. Later on she started preparing noodles even better than me. They were yummier than the ones I had eaten in restaurants. In Bangalore, rice noodles were somehow not easily available and so during our stay there for 2 years, we were forced to deprive ourselves of the pleasure of indulging in noodles. Anyway, recently I got this really fine quality rice noodles from an Asian store here. I tried to cook with it the first thing I have missed all these years after marriage, the stir fried noodles cooked by my mother. I twisted the ingredients a little here and there according to convenience, but the end result turned out to be similar in taste: Scrumptious. 2) Heat oil in a non-stick skillet. When oil turns hot, add mushroom and stir-fry. Add prawns and chicken and shallow fry, stirring occasionally. When done, take them off the flame and keep aside. 3) Into the same oil, add garlic and fry till golden brown. Add carrot and cauliflower. Shallow fry till both of them change color to golden brown. 4) Add green beans and capsicum. Stir-fry till golden brown in color. 5) Meanwhile as the vegetables are being fried, in a saucepan, prepare the sauce by mixing vegetable stock with dark soya sauce, green chilli sauce, sugar, lemon juice and paprika. Bring the sauce to a boil. 6) Stir corn starch or corn flour in 4 tbsp water until fully dissolved. Add more water if needed. 7) Pour the corn starch mixture into the sauce on oven and simmer for couple of minutes till the sauce thickens. When ready, keep aside. 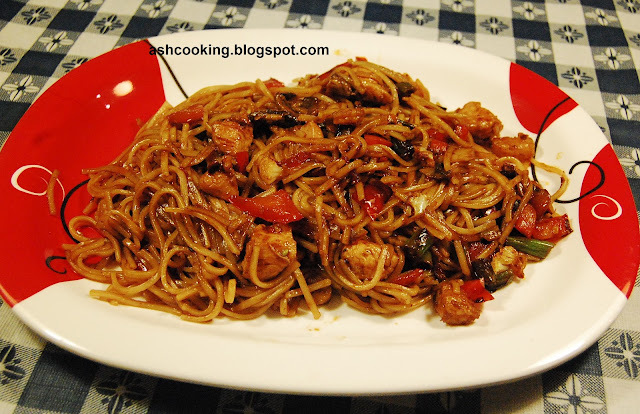 5) Back to the noodles, when vegetables are all fried and tender, toss in the fried chicken, mushroom and prawn mixture. Stir for 1 minute and then add half of the prepared sauce. Stir-cook for couple of minutes. 7) Add salt and paprika. Mix in.